Russian mathematician and engraver; born at Seiny, government of Suwalk, in the first quarter of the nineteenth century; died at Jerusalem in 1897. He made many important discoveries in mathematics and especially in mechanics, the detailed accounts of which are given in the "Königsberger Zeitung," supplement to No. 211, Sept. 11, 1859. Among others he discovered a method by which the same force causes two different movements of two equal cog-wheels to dovetail with each other (ib. No. 8, Jan. 11, 1856). His engravings were awarded a prize at the Königsberg Exhibition of 1858 ("Journal of the Politechnische Gesellschaft zu Königsberg," Oct. 9, 1858, p. 41). 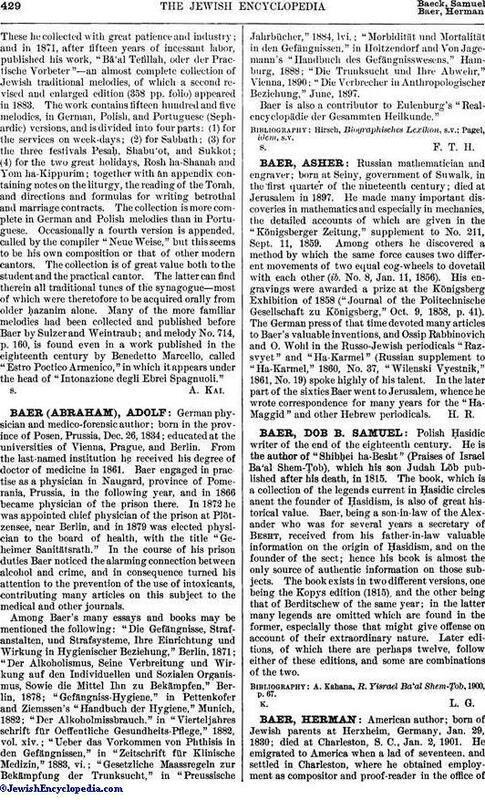 The German press of that time devoted many articles to Baer's valuable inventions, and Ossip Rabbinovich and O. Wohl in the Russo-Jewish periodicals "Razsvyet" and "Ha-Karmel" (Russian supplement to "Ha-Karmel," 1860, No. 37, "Wilenski Vyestnik," 1861, No. 19) spoke highly of his talent. In the later part of the sixties Baer went to Jerusalem, whence he wrote correspondence for many years for the "Ha-Maggid" and other Hebrew periodicals.